A collection of dining tables with a top that has a chamfered edge either in transparent extralight glass 15 mm. thick or in laminated 8+8 mm. thick glass in three special transparent colors: yellow cedar, warm grey, rose-colored orange. 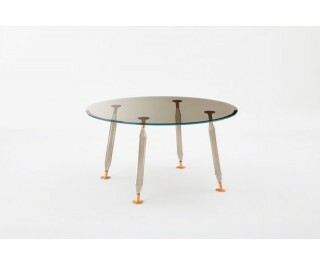 The legs, in blown and molded borosilicate glass, can have a neutral transparent finish or be finished in the same color as the top. The legs can be dismantled and are screwed to the top and lay on the floor by means of specially finished feet in brushed and anodized aluminum in the following colors: gold, rose-colored copper, bronze or nickel.